Update note: Ron Kliffer updated this tutorial for Xcode 10, Swift 4.2, iOS 12 and RxSwift 4.4.0. Ellen Shapiro wrote the original. It’s great when code does exactly what you want (unlike my cat). Change the program, tell the code to update, and it does. Good code! Most programming in the object-oriented era has been imperative. Code tells your program what to do and has many ways to listen to changes. However, you must tell the system when something changes. Wouldn’t it be better if you could set things up so the code updates reflect changes automatically? That’s the idea of reactive programming: Your application can react to changes in the underlying data without you telling it to do so. This makes it easier to focus on the logic at hand rather than maintaining a particular state. You can achieve this in Swift through Key-Value Observation and using didSet, but it can be cumbersome to set up. Alternatively, there are several frameworks in Swift that facilitate reactive programming. Note: For more background, see Colin Eberhardt’s great article outlining the differences between major frameworks. Check out the comments section for further discussion. In this tutorial, you’ll use the RxSwift framework and its companion RxCocoa to take a chocolate-buying app from imperative to reactive. What are RxSwift and RxCocoa? RxSwift and RxCocoa are part of the suite of ReactiveX (Rx) language tools that span multiple programming languages and platforms. RxSwift is a framework for interacting with the Swift programming language, while RxCocoa is a framework that makes Cocoa APIs used in iOS and OS X easier to use with reactive techniques. ReactiveX frameworks provide a common vocabulary for tasks used repeatedly across different programming languages. This makes it easy to focus on the syntax of the language itself rather than figuring out how to map a common task to each new language. Two key concepts are the Observable and the Observer. An Observable emits notifications of change. An Observer subscribes to an Observable and gets notified when that Observable has changed. You can have multiple Observers listening to an Observable. When the Observable changes, it will notify all its Observers. The DisposeBag is an additional tool RxSwift provides to help deal with ARC and memory management. Deallocating a parent object results in the disposal of Observer objects in the DisposeBag. When deinit() is called on the object that holds the DisposeBag, each disposable Observer is automatically unsubscribed from what it was observing. This allows ARC to take back memory as it normally would. Without a DisposeBag, you’d get one of two results. Either the Observer would create a retain cycle, hanging on to what it’s observing indefinitely, or it could be deallocated, causing a crash. To be a good ARC citizen, remember to add any Observable objects to the DisposeBag when you set them up. The DisposeBag will clean up nicely for you. It’s time for you to get to the chocolate! Use the Download Materials button at the top or bottom of this tutorial to download the starter project. After you’ve done so, open Chocotastic.xcworkspace. Later in the tutorial, you’ll come back to set this up using purely reactive programming. For now, tap the Cart button to return to the cart summary. Then, tap the Reset button to return to the main screen with an empty cart. Now that you’ve seen what the application does, it’s time to examine how it works. Open ChocolatesOfTheWorldViewController.swift. 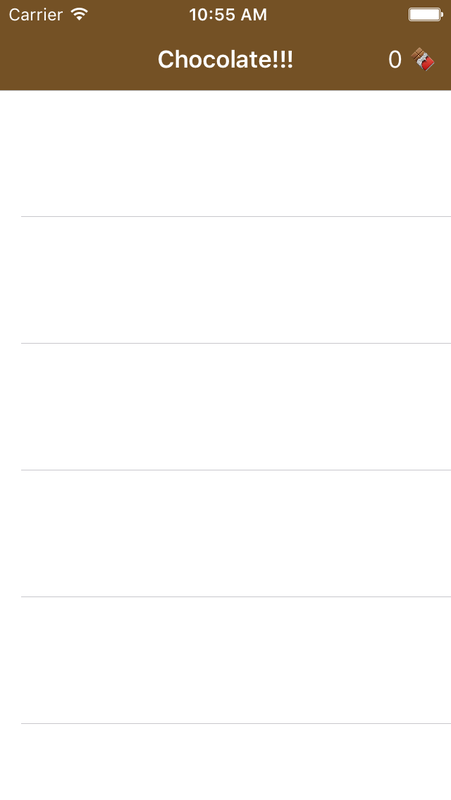 You’ll see some standard UITableViewDelegate and UITableViewDataSource extensions. viewWillAppear(_:): Before showing the view controller. 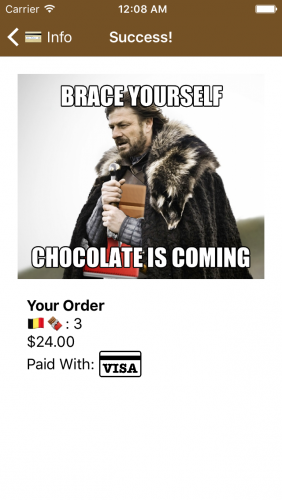 tableView(_:didSelectRowAt:): After a user adds a new chocolate to the cart. These are both imperative ways of changing the count. You must explicitly call the method to update the count. You’re going to rewrite the code to use a reactive technique. That way, the button will update on its own. Right now, you can’t observe changes to the contents of chocolates . You could add a didSet closure to its definition, but that would only get called when the entire array updates, rather than any of its elements. Note: This change will cause errors in the sidebar. You’ll fix those in a moment. This syntax can be a little hard to wrap your head around. It helps to understand what’s going on. 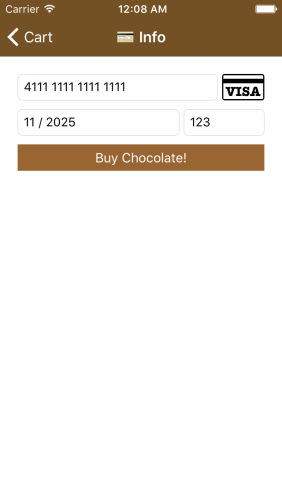 Essentially, rather than setting chocolates to a Swift array of Chocolate objects, you’ve now defined it as a RxSwift BehaviorRelay that has a type of a Swift array of Chocolate objects. BehaviorRelay is a class, so it uses reference semantics. This means that chocolates refers to an instance of BehaviorRelay. BehaviorRelay has a property called value. This stores your array of Chocolate objects. The magic of BehaviorRelay comes from a method called asObservable(). Instead of manually checking value every time, you can add an Observer to keep an eye on the value for you. When the value changes, the Observer lets you know so you can react to any updates. The downside is that if you need to access or change something in that array of chocolates, you must do it via accept(_:). This method on BehaviorRelay updates its value property. That’s why the compiler is throwing a tantrum and presenting a fistful of errors. Time to fix them! Whew! That should make Xcode happy and take care of the errors. 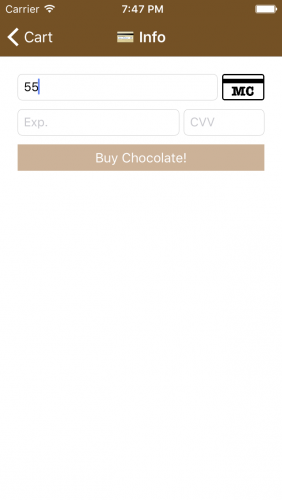 Now you can take advantage of reactive programming and observe chocolates! This creates the DisposeBag you’ll use to clean up any Observers you set up. This sets up a reactive Observer to update the cart automatically. As you can see, RxSwift makes heavy use of chained functions, meaning that each function takes the result of the previous function. 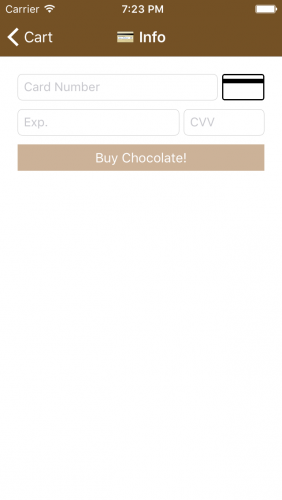 Grab the shopping cart’s chocolates variable as an Observable. Call subscribe(onNext:) on that Observable to discover changes to the Observable’s value. subscribe(onNext:) accepts a closure that executes every time the value changes. The incoming parameter to the closure is the new value of your Observable. You’ll keep getting these notifications until you either unsubscribe or dispose of your subscription. What you get back from this method is an Observer conforming to Disposable. Add the Observer from the previous step to your disposeBag. This disposes of your subscription upon deallocating the subscribing object. To finish, delete the imperative updateCartButton(). This will cause errors to appear where it was being called in viewWillAppear(_:) and tableView(_:didSelectRowAt:). To fix them, delete the entire viewWillAppear(_:) since calling updateCartButton() is the only thing it’s doing beyond calling super. Then, delete the call to updateCartButton() in tableView(_:didSelectRowAt:). Uh-oh. 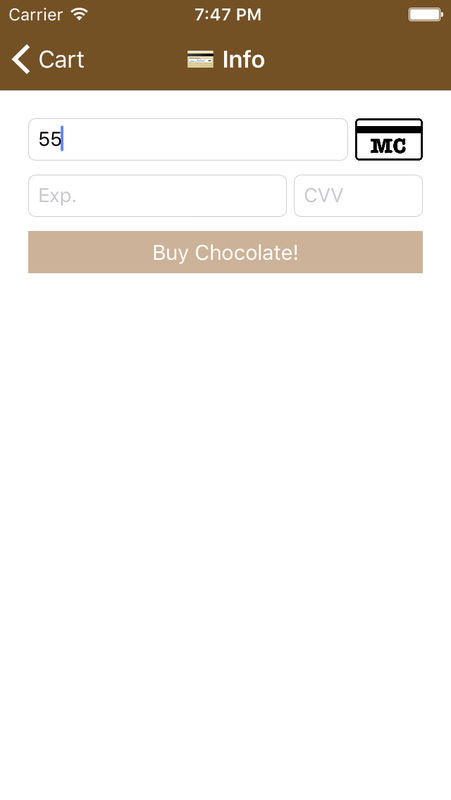 The cart button only says Item, and when you start tapping on the list of chocolates, nothing happens. What went wrong? Tap on some chocolates — the number of items in the cart now automatically updates! Success! You can now add all the chocolates to the cart. 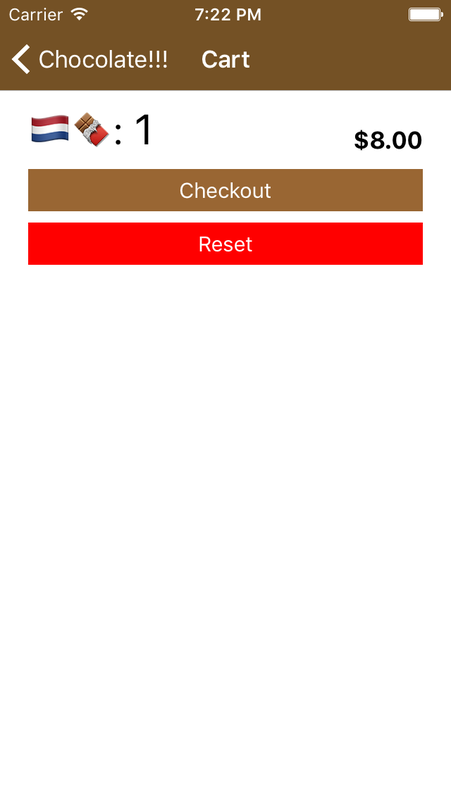 Now that you’ve made the cart reactive using RxSwift, you’ll use RxCocoa to make your UITableView reactive, too. RxCocoa has reactive APIs for several different types of UI elements. These allow you to create table views without overriding delegate or data source methods. To demonstrate this, delete the entire UITableViewDataSource and UITableViewDelegate extensions from ChocolatesOfTheWorldViewController.swift . Next, delete the assignments to tableView.dataSource and tableView.delegate from viewDidLoad(). That’s no fun. Time to restore the chocolates! just(_:) indicates that there won’t be any changes to the underlying value of the Observable, but that you still want to access it as an Observable value. Call bind(to:) to associate the europeanChocolates observable with the code that executes each row in the table view. By calling rx, you access the RxCocoa extensions for the relevant class. 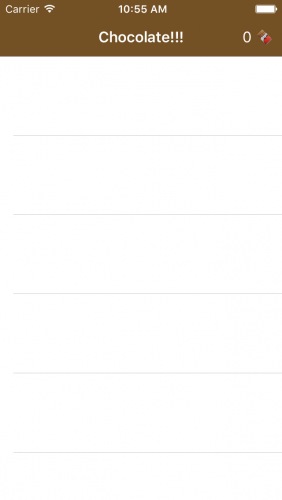 In this case, it’s a UITableView. Call the Rx method items(cellIdentifier:cellType:), passing in the cell identifier and the class of the cell type you want to use. The Rx framework calls the dequeuing methods as though your table view had its original data source. Pass in a block for each new item. Information about the row, the chocolate at that row and the cell will return. Take the Disposable returned by bind(to:) and add it to the disposeBag. The values normally generated by tableView(_:numberOfRowsInSection:) and numberOfSections(in:) are now automatically calculated based on the observed data. The closure effectively replaces tableView(_:cellForRowAt:). Build and run the application, and voilà! Your chocolates are back! When you try to tap on each chocolate, however, they don’t appear in the cart. Did you break something with your earlier Rx method? Nope! Removing tableView(_:didSelectRowAt:) took away anything which would recognize cell taps or know how to handle them. To remedy this, there’s another extension method RxCocoa adds to UITableView called modelSelected(_:). This returns an Observable you can use to watch information about selected model objects. Call the table view’s reactive extension’s modelSelected(_:), passing in the Chocolate model type to get the proper type of item back. This returns an Observable. Taking that Observable, call subscribe(onNext:), passing in a closure of what should be done any time a model is selected (i.e., a cell is tapped). Within the closure passed to subscribe(onNext:), add the selected chocolate to the cart. Also in the closure, deselect the tapped row. subscribe(onNext:) returns a Disposable. Add it to the disposeBag. Build and run. You’ll see your familiar list of chocolates, but now you can add them to your heart’s content! RxSwift can both take and react to direct text input by the user. To get a taste of handling text input reactively, try adding validation and card type detection to the credit card entry form. A tangle of UITextFieldDelegate methods handle credit card entry in nonreactive programs. Often, each contains a mess of if/else statements indicating the actions and logic to apply based on the text field you’re editing. Reactive programming ties the handling more directly to each input field and clarifies what logic applies to which text field. As before, this defines a DisposeBag to ensure disposal of all your Observables. It’s nice for users to see what type of credit card they’re inputting based on known card types. Add an Observer to the value of a BehaviorRelay. Subscribe to that Observable to reveal changes to cardType. Ensure the observer’s disposal in thedisposeBag. You’ll use this to update the card image based on changes to the card type. Now for the fun part: Text change handling. Since a user might type quickly, running validation for every key press could be computationally expensive and lead to a lagging UI. Instead, debounce or throttle how quickly the user’s input moves through a validation process. This means you’ll only validate the input at the throttle interval rather than every time it changes. This way, fast typing won’t grind your whole app to a halt. Throttling is a specialty of RxSwift since there’s often a fair amount of logic to be run when something changes. In this case, a small throttle is worthwhile. Return the the contents of the text field as an Observable value. text is another RxCocoa extension, this time to UITextField. Throttle the input to set up the validation to run based on the interval defined above. The scheduler parameter is a more advanced concept, but the short version is that it’s tied to a thread. To keep everything on the main thread, use MainScheduler. Transform the throttled input by applying it to validate(cardText:) provided by the class. If the card input is valid, the ultimate value of the observed boolean will be true. Take the Observable value you’ve created and subscribe to it, updating the validity of the text field based on the incoming value. Add the resulting Disposable to the disposeBag. The code for the expiration date and CVV validation follows the sample pattern. This uses Observable’s combineLatest(_:) to take the three observables you’ve already made and generate a fourth. The generated Observable, called everythingValid, is either true or false, depending on whether all three inputs are valid. everythingValid reflects the isEnabled property on UIButton‘s reactive extension. everythingValid’s value controls the state of the purchase button. If all three fields are valid, the underlying value of everythingValid will be true. If not, the underlying value will be false. In either case, rx.isEnabled will apply the value to the purchase button, which is only enabled when all the the credit card details are valid. Delete the 4, and the card image will change back to unknown. Type in 55, and the image will change to MasterCard. Neat! 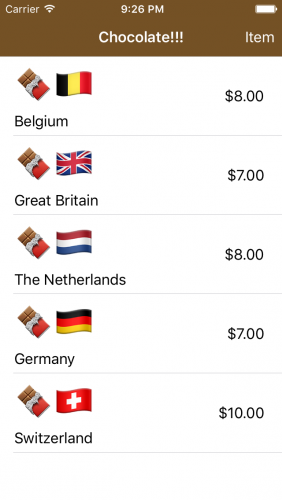 This app covers the four major credit card types in the United States: Visa, MasterCard, American Express and Discover. If you have one of those types of credit cards, you can input the number to see the correct image pop up and check to see if the number is valid. Note: If you don’t have one of those credit cards, use one of the test card numbers that PayPal uses to test their card sandbox. These should pass all local validation in the application, even though the numbers themselves are not usable. Change the CartViewController to use a reactive table view (instead of a label) to display the contents of the cart. 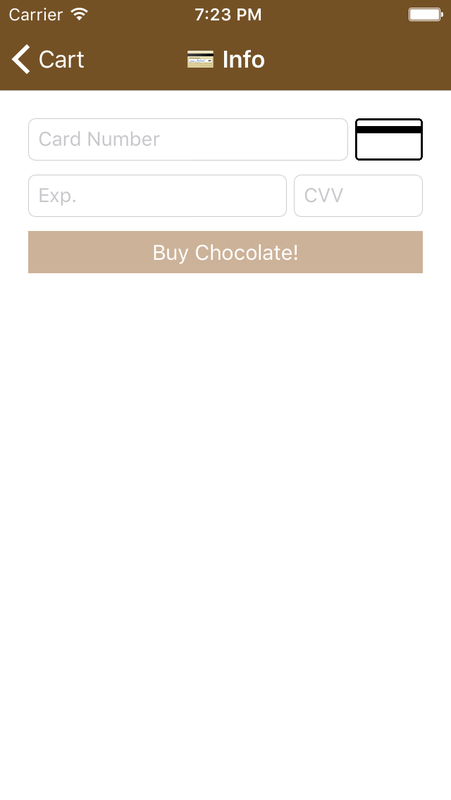 Allow the user to add or remove chocolates directly from the cart, automatically updating the price. Finally, our own Marin Todorov has a great blog about his adventures in Reactive programming called rx_marin. Check it out! 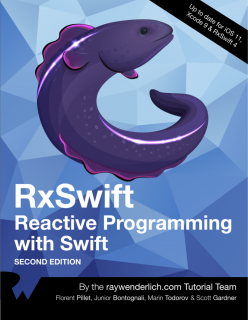 If you enjoyed this tutorial, check out our RxSwift book, available in our store. Getting Started: Get an introduction to the reactive programming paradigm, learn the terminology involved and see how to begin using RxSwift in your projects. Event Management: Learn how to handle asynchronous event sequences via two key concepts in Rx — Observables and Observers. Being Selective: See how to work with various events using concepts such as filtering, transforming, combining, and time operators. UI Development: RxSwift makes it easy to work with the UI of your apps using RxCocoa, which provides an integration of both UIKit and Cocoa. Intermediate Topics: Level up your RxSwift knowledge with chapters on reactive networking, multi-threading, and error handling. Advanced Topics: Round out your RxSwift education by learning about MVVM app architecture, scene-based navigation, and exposing data via services. By the end of this book, you’ll have hands-on experience solving common issues in a reactive paradigm and be well on your way to coming up with your own Rx patterns and solutions! Have questions or other Rx resources to suggest? Sound off below in the comments, or in the forums.